The first step to starting an internet business is to create the business entity. This involves forming a corporation, LLC, or partnership with the Secretary of State (or equivalent state agency). If you would like to operate your business as a sole proprietorship, then you may only need to register the name by which you operate your business by filing a trade name of “doing business as” (DBA) certificate. This will need to be filed on the state or local level, or both. Next, you must obtain an EIN (employer identification number) for the entity from the Internal Revenue Service (IRS). This number will be used for identification purposes during the federal tax purposes for the life of the business. Next, you must register for state and local taxes. A Sales Tax ID Number or sellers permit, is an account identification number issued by the state. Obtaining the ID number enables a business to collect the required taxes, pay state sales taxes, and obtain resale certificates. Sales tax is generally imposed on retail sales, leases, rentals of most goods, and on some services. Internet businesses are generally required to follow the same federal, state and local tax laws as regular businesses. Online businesses are responsible for collecting state and local sales taxes from their customers when applicable. Businesses that sell goods on the internet must adhere to federal regulations regarding internet sales. The Federal Trade Commission Bureau of Consumer Protection has rules for online merchants. Under the Mail or Telephone Order Merchandise Rule, internet merchants must follow specific guidelines for making promises about shipments, notifying customers about shipping delays, and refunding customers. State and local business licenses may apply depending on the specific activity of the internet business. If there is a statewide basic business license, the internet business will likely need to obtain that license. If the internet business is selling a regulated product, like durable medical equipment or prescription drugs, additional professional licenses will be required. 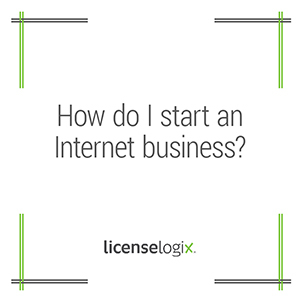 LicenseLogix will help guide internet businesses through the entire licensing process, whether they are seeking an initial license or managing ongoing renewals. We can help you obtain all of the licenses and registrations you need, minimizing time-consuming and costly delays. For additional help you can fill in the form on the right or give us a call at (800) 292-0909.